Marion, VA -- Song of the Mountains will present two talent packed fundraising concerts at the Lincoln Theatre in Marion, VA on Saturday, June 22nd. “We will be presenting a matinee at 2:00 pm and an evening concert at 7:00 pm”, states Tim White the show’s host and executive coordinator. “We are excited that Ralph and Nathan Stanley will be on the evening concert and also at our pre-concert meet and greet at 5:30 the same day”, says White. In addition to the two concerts and the “meet & greet” with the Stanleys there will also be a silent auction with one of the major items being an autographed Deering “Calico” banjo signed by many artists who have performed on Song of the Mountains over the past three years. 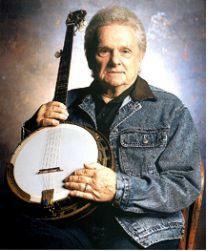 These autographs include the late Doc Watson, Dr. Ralph Stanley, Doyle Lawson and many others. The two concerts have a world class lineup of talent. The 2:00 pm matinee at the Lincoln Theatre includes the Redhead Express, Michael Reno Harrell, Raymond McLain, VW Boys, James Smith the Autoharp Man, Celtibillies, Donna Ulisse, Comedy of Phil Campbell, Magic of Dave Vaught and Comedy of Phil Fox. The 7:00 pm evening concert will headline Dr. Ralph Stanley and Nathan Stanley, Redhead Express, Raymond McLain, VW Boys, James Smith the Autoharp Man, Celtibillies, Donna Ulisse, Comedy of Phil Campbell, Magic of Dave Vaught and the Comedy of Phil Fox. “I know that our concert series is loved by viewers across our nation and beyond. We do need the support of everyone who enjoys the music from our region and this event is a major part of our fundraising for the year. What a fantastic lineup of talent we have coming to support our program and all of us at Song of the Mountains and the Lincoln Theatre appreciate their generous donations of their talent to help us raise the dollars necessary to continue to provide our program to millions of people each year”, states White. “I do urge fans and friends of our program to visit our website www.songofthemountains.org for other ways folks can contribute to the Lincoln Theatre and Song of the Mountains concert series”. This Song of the Mountains concert on June 22nd begins at 7:00 pm. Tickets are $ 15 and information is available at www.songofthemountains.org or by calling 276-783-6093. Song of the Mountains is underwritten for public television by TEDS, the General Francis Marion Hotel in Marion, VA, The Appalachian Cultural Music Association and the Mountain Music Museum in Bristol, TN, Blue Ridge Country 98.1 fm, The Bank of Marion, Morehead State University, Bryant Label Co. of Blountville, TN. Special support from the Town of Marion, VA. Also Song of the Mountains appreciates all the support received from their faithful supporters who contribute dollars to keep this concert series funded and on public television across America.